Governor Chet Culver presented 22 people with one of the state’s highest honors today. The Governor’s Lifesaving awards are given to those who saved, or tried to save, lives. "Being an Iowan means many things to many people. But there’s one common bond that unites everyone that lives in our great state, a never ending commitment to serve our fellow citizens. And this spirit of service is alive and well here this morning, " Culver said. 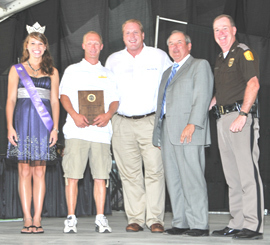 Governor Culver presented the awards this morning at the Iowa State Fair. Culver says, "It is my privilege to recognize your efforts. This is one of the highest honors our state can give. And each and every one of you are deserving of it. So on behalf of the people of the state of Iowa I simply want to say thank you for your heroism and for the example each of you have set." Department of Public Safety Commissioner, Gene Meyer, read about each of the recipients as each of the awards was presented. Including the story of how Dan Davis of Badger rushed into his neighbor’s burning home in the early morning hours of June 16th, 2008. "Without regard for his own safety, Dan crawled on his hands and knees searching throughout the home before he found Hanah, age 17, and Max age 16, asleep in their bedrooms. Fighting through the thick black smoke, he helped the two teenagers escape the burning flames," Meyer read. Davis received the Governor’s Lifesaving Award with valor for risking his own life to save the teens. Davis received a lifesaving award with valor. A group of men who pulled a woman from the Des Moines River after her boat went over the Center Street dam in Des Moines were also given awards. Several people who responded in the wake of the Parkersburg tornado also won awards. See a complete list of the awards on the link below. See more pictures of the award winners here.